Exactly what it says! This is a completly RANDOM blog with random reviews, lists, polls, and LOTSA crap you never thought you'd want to read about! Oh but you do! YOOUUU DOO!!!! 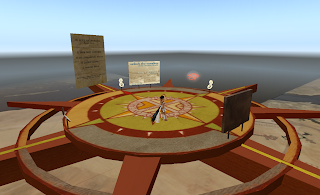 I have always wondered...why is it that most everyone wants to be well coifed and well dressed in SL? Who are they trying to impress? I love the days when I can just be me, be a little on the wild side. And on those days I am glad I have my sissy/best friend Colorful around. We know how to unwind and give into having fun. With this I bring you the clowns!!!! Hope you enjoy them both as I did!!! Hai there! The name is Liane. Long time friend to Sanura and Colorful. But also sissy to Colorful. I love to shop, make friends and take pictures at my studio in SL. I love random stuff (so I am glad to be in this blog ha ha) and I love goofing off. Hopefully I will be doing more postings here. Whatever comes to mind....I will share with you all. It's gonna sneak up on everyone fast! Count on it! And to give your SL home a bit more Xmas spirit there is a little shop completly free with some awsome xmas goodies! This adorable little shop is put on by Corbin Coage Creations and Cheeky Pea. Its called Mr. Scrooge's Holiday Shop. This is all stuff that they've spent their time and effort to create and amazingly they are giving these tigns away for free! When I talked to Mr. Coage, I asked why he decided to give all these things for free he said it was part of the holiday spirit. Inside the small building is where you buy all the thigns ranging from holiday cards to stockings to snowmen to reindeer! 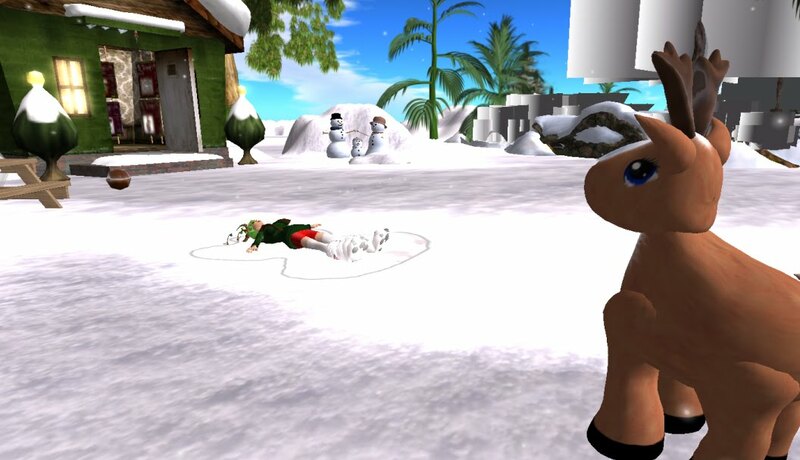 And several of the thigns are animated so you can play in snow or build snowmen. (514): i pretty much saved your life. you were so conviced that your nail polish remover bottle was "Vodka Lemon"
(678): All she gave me for breakfast was raw toast. How can she expect me to eat raw toast? (443): shhh. i hid the ranch dip behind the rooster. don't tell anyone that way you can find it in the morning and it won't be all eaten. (360): Stop being a whore!!! Everyone can see!!!! (618): so i'm just gonna leave my credit card in your mailbox so you can bail me outta jail.. deal? (715): went to the bathroom to piss, saw puke in the toilet thought wtf i dont remember puking, then turned around to find a chick i've never seen before passed out in my shower. Go rent it!! NOW! GO! What are you still doing here!! Go buy or rent it! I don't know how many of you actually like to take the time to explore in SL but you really should start too because there are some AMAZING sims out there. Such as this one. 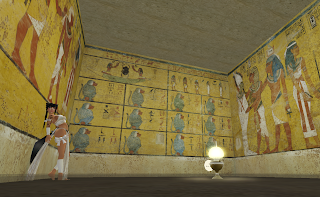 The King Tut Virtual world. I've always have a passion for egypt so I was extremly excited when my friend Kloe told me about this place, and it did not dissapoint. I was impressed the second I landed because you land on a Giant compass with a map underneath you. Now just exploring by myself looking at stuff is tons of fun but Oh no, they went the extra mile with this place and provided an audio tour! After you listen to the 4 audios at the starting point (You don't half too but I think you should) You can click the eye and it will take you to the entrance to the tomb. Theres 4 audio's set up in the wall paintings room to explain what each mean/symbolize. When you click the eye at the entance to the tomb it will take you to the next location which was my favorite part. In the middle of the room is the Outer and Second outermost Funerary shrines, in two of the outer rooms are examples of real artifacts from ancient egypt, and I must say, the artifacts! Holy crap! They looked soo real I almost thought I could reach out and grab them. In the third room there is the sarcophagus of Tut!! BOW DOWN BEFORE TUT! If you touch the audio it will explain the layers of the sarcophagus and the sarcophagus will actually raise and peel apart for you. Very cool! To the left of the house.... or the right depending on where your looking from is a bunch of vendors with items made epecially with the egyptian theme for this place, I know some of you were going crazy not getting to shop for an hour here on SL, SL shopping is a horrible addiction. But this should help feed your addiction because theres some impressive stuff from impressive people. Last but not least on my tour, I went to the cosmic gallery, and....... amazing, simply breath taking. Be sure you set your world to midnight for this! And look down thru the floor to the swirl underneath. I wanted to take a picture o this to show you all but any picture I could take would not capture its beauty. Just be sure to go look at it! I spent about an hour just chillin in the cosmic gallery. Just looking at everything floating in there. I'm sure I'll end up going back, You should all go check it as well before SL costs causes the creator to have to pick it up for some reason.